Luke Schaefer is the Executive Director of Central Regional Education Association (CREA). Luke taught music in grades 5-12 for seven years in Des Lacs-Burlington Public School, ND where he also served as the AdvancEd Lead Team Chair, Tech Team member, and coach for football, wrestling, and track. After serving under multiple principals, he realized his desire to affect change at a different level and changed his role to lead the students and staff of Sawyer Public Schools as their Superintendent and High School Principal. Luke has a Masters of Education in Educational Leadership from North Dakota State University and a Bachelor of Science of Music Education from Minot State University. Alissa Thiele is the Marketing and Recruitment Coordinator at CREA and has been with the organization for three years. Prior to moving to Bismarck, Alissa attended North Dakota State University where she majored in Mass Communication. 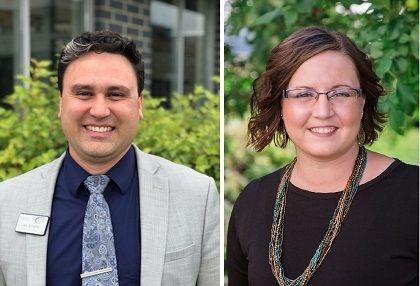 In this article, Luke and Alissa discuss how regional education associations in North Dakota support and provide services to North Dakota schools, specifically highlighting opportunities that are provided by the Central Regional Education Association (CREA). Central Regional Education Association (CREA) is the largest regional education association (REA) in North Dakota. You may not have heard of an REA before, but North Dakota has seven of them. They provide services to schools, educators, students, and communities across the state. CREA is the product of a merger that will become final on July 1st, 2019 between Missouri River Educational Cooperative based in Bismarck and Mid-Dakota Educational Cooperative based in Minot. After the merger, CREA will serve 54 public and private schools and provide programs and services for approximately 40,000 students and 3,000 educators across 17,000 square miles. Some people may wonder why REAs exist. Each day, the REAs work tirelessly to support schools regardless of their geographic location so that students gain every opportunity possible. Staff at CREA work diligently to support educators in every way that they can to provide opportunities for students. CREA staff know that there is no problem too big or too small and work to provide community-based solutions. They have tremendous respect for educators and the work they do every day developing young learners and work tirelessly to help equalize the playing field for small and large districts alike. To explain how CREA's programs and services are utilized in the schools in our region, we'd like to take you on a journey with a student named Josh. Josh is a 4th grade student in a North Dakota public school. Every week day on their way to work, Josh’s parents drop him off at a before school CREA program called the Extended School Program. While he’s there, Josh dives into hands-on, project-based educational activities and games with other students who arrive before the school day. Once the school day begins, Josh’s teacher, Mr. Anderson, discusses how to identify the main character in a story. The class used paintings to show who the main character is and what their characteristics are. Mr. Anderson learned the method of using arts to enhance his lessons from a Turnaround Arts: ND Picturing Writing class he took that CREA co-hosted with the support of the ND Council of the Arts. Mr. Anderson also has noticed that Josh has been excelling in math. To keep him from getting bored, he advances some of Josh’s work through the interventions built within his school’s Multi-Tiered System of Support (NDMTSS). NDMTSS is a framework to provide all students with the best opportunities to succeed academically and behaviorally in school.NDMTSS focuses on providing high-quality instruction and interventions matched to student need, monitoring progress frequently to make decisions about changes in instruction or goals. Josh gets to work with students a grade above his during math ever since their school learned about and implemented NDMTSS. CREA is working with Josh’s school to develop an MTSS system that helps identify not only struggling students, but students who are excelling. While Josh was advanced in his math skills, his little sister, Lauren, struggles to keep up in reading. Lauren partakes in her school’s Reading Corps program where she receives extra help from a trained tutor for 20 minutes a day, 5 days a week. Lauren doesn’t know this, but CREA provides Reading Corps services to students in 13 schools during this school year. Just like math is easier for Josh to learn, he has no problems with making friends either. He met a fellow classmate, Maria, after she moved from a different country. His school isn’t big enough to hire a specialist so they contract with CREA to provide an English Learner specialist to help her effectively learn the English Language while preserving her culture and heritage. Josh and Maria love to sit with each other and talk while they enjoy their lunch. Since the food service staff at Josh’s school have recently taken a series of culinary skills trainings from CREA, the staff started preparing delicious, new healthy school lunches that the students really enjoy. However, no matter how healthy the school lunches are, Josh continues to be aware and worries about his Diabetes numbers. He frequently runs down to the office to check them with the ND e-Nurse that the school provides through CREA. Josh’s parents really appreciate getting frequent updates and check-ins on his health while at school. After lunch and recess, Josh’s class listens to the school counselor talk about all the different careers. Due to a shortage of Kindergarten-12th grade counselors in ND, Josh’s school has had trouble hiring a counselor. Similar to working with the Language Specialist, Josh gets to learn from one of the CREA counselors, who also helps small groups and individual students with topics such as bullying, academic support, and social emotional development. As mentioned earlier, while Josh has an easy time making and keeping friends, some of his classmates have a harder time working and playing with others. Instead of putting students in the hallway, the school has begun teaching all students about five sets of skills that help them recognize and manage their emotions and understand how to interact with others depending on their attitude. They also are working hard to help students make responsible decisions and solve problems by themselves and with others. The principal at Josh’s school asked CREA to help the staff at the school to understand how best to support the social and emotional aspects of learning of the students. Staff at Josh’s school want to make sure that students could find success in their academics and their friendships, while being responsible and accountable for their actions. Josh’s day ends with a bus ride home. His bus driver, Clint, greets him with a smile and a high five as Josh is getting on board. Josh looks around at his fellow bus mates who are all seated in their assigned spots. Clint, having attended a training for bus drivers with CREA staff, reminds all of the students about expectations for the bus and lets them know he’s ready for a great ride home. Since so much of school is about learning how to learn and figuring out what a student wants to be when they grow up, Josh hears from his older sister, Lorie, quite a bit when he gets home. She’s currently working on getting her pilots license and is taking an online Aviation course that is available through a partnership between CREA and Missouri River Area Career and Technical Center. She has figured out that she wants to be a pilot for her career. Every day it is hoped that students like Josh are exposed to opportunities that didn’t exist before as they prepare for careers and jobs that haven’t even been invented yet. And every day a CREA staff member is asking, “How can I make things better for the students in our schools?” CREA staff can’t thank educators, school staff, and administration enough for their commitment to facilitating the learning process with students day in and day out. CREA is continualy adding new programs and services as needs arise in our schools. We are also working to ensure continuous improvement in our existing programs. We are funded in multiple ways, through fee-for-service, grants, contracts, and school membership; we are able to provide a vast array of the services mentioned above. We have the great pleasure of having a partner in the CREA Foundation who works diligently to raise funds for our students to have increased opportunities. They assist us with grant-writing, which is a large portion of how we pay for our work to happen. However, sometimes we need extra assistance and they seek funders who are interested in helping with a specific program, like the Equine Therapy, Helping English Language Proficiency, School Counseling, Native American Culture and Language, and Arts-Based Education programs. Many of our programs look to find volunteers to assist us with students; including the Missouri River Area Career and Technical Center, Reading Corps, Poverty Simulations, and Extended School Programs. CREA exists to make educators’ jobs a little easier. If you’d like to find out more about us or how you can help, please visit our website, stop by our office, or schedule a time to see one of our programs in action! While CREA’s new website is still in development, more information can be obtained at www.creand.org which will redirect you to our existing websites. Or feel free to contact us at 701.751.4041. 5 Years of North Dakota Compass! Kristi Huber: Do you know the Return on Investment on your charitable giving? Lynette Schaff: Bullying- Just a Schoolyard Problem? Think Again! John Trombley: Competition is Tough; Why Make it Tougher? Jacob Sowers: Places and their story: More than just a spot on the map? Neil Scharpe: "Protecting North Dakota's Quality of Life"
Donald Warne: "American Indian Health Disparities in North Dakota"
Kay Schwarzwalter: "Community building through community gardens"
Jasper Schneider: "Rural Development in North Dakota"
Dean Bangsund: "Economic contribution of the petroleum industry in North Dakota"
Jane Strommen: "Addressing the education and support needs of older North Dakotans and their family members"
Randi Roth: "In Support of North Dakota Communities"
Richard Rathge: "Vision of North Dakota Compass"
Paul Mattessich: "What's the real poverty rate?"